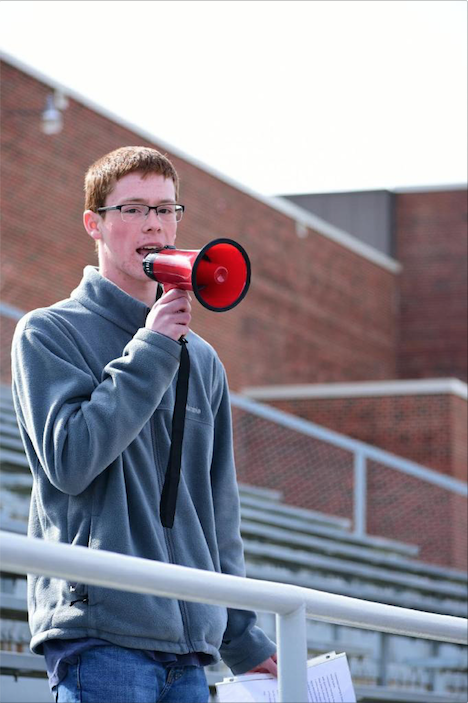 At 10 a.m. on April 20, 140 high school students filed out of their classrooms and filled the lanes of the CFHS track. Their reason for leaving their classes in the middle of the period was to add their voices to the students around the nation who were honoring the lives of the 17 killed in the Parkland, Fla., shooting, to recognize the anniversary of Columbine and to voice their anger over gun violence. “I am so glad that we are here joined by thousands of other students today across the nation. 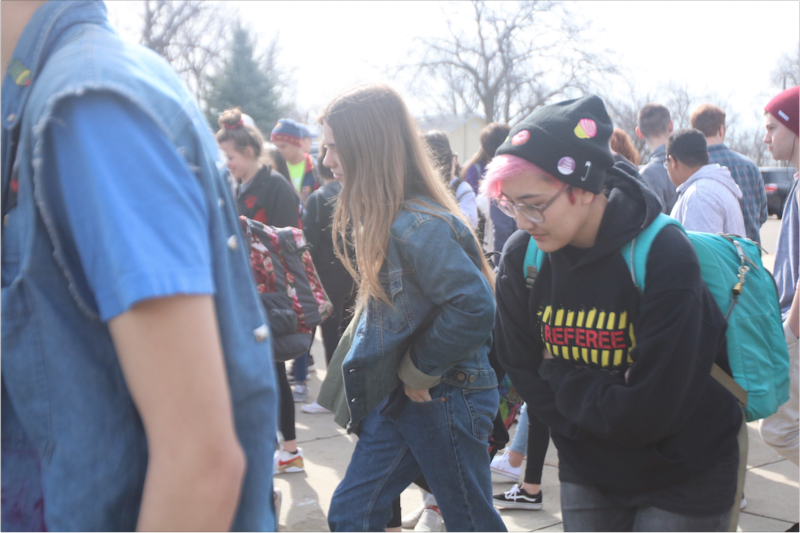 To use our voices to say we care, we are affected and we demand change,” said sophomore Kellen Chenoweth, a speaker at the walkout. “As students, a majority of who are underage and cannot vote, it’s easy to dismiss our ability and responsibility to push for a change when change is needed,”she said. When the CFHS Young Democratic Club president Ryan Westhoff heard of other schools participating in their own walkouts, he immediately thought that Cedar Falls could contribute to this national event of political activism. 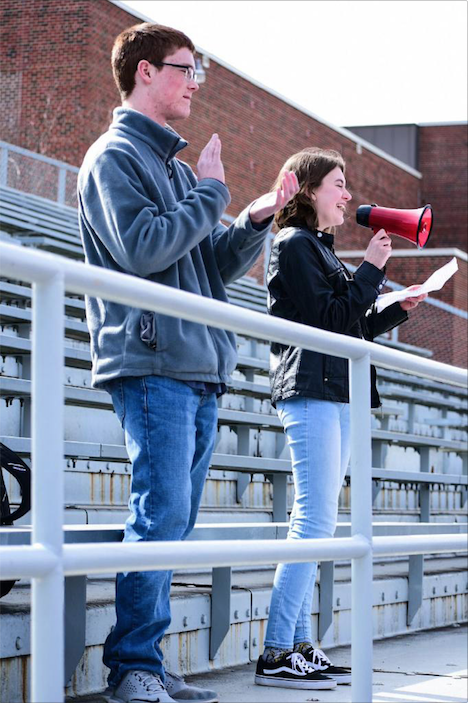 “We wanted to create a larger conversation around the issue of gun control as well as show that we are continuing our activism and that we won’t go away anytime soon,” Westhoff said. 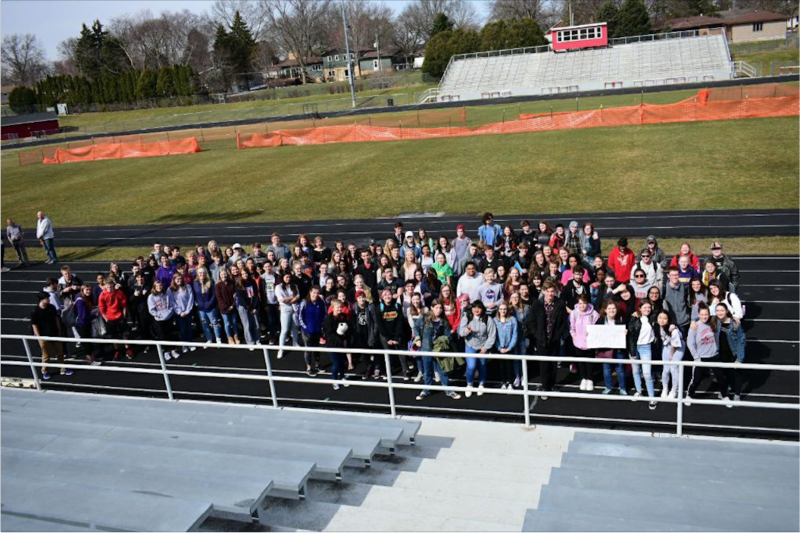 Since the high school is a public school, the walkout could not be school-sponsored, meaning the CFHS Young Democrats Club had to spread details about the event through social media and by word. “We could not use the announcements or design posters to hang at school, and instead we had to get things out by word of mouth. 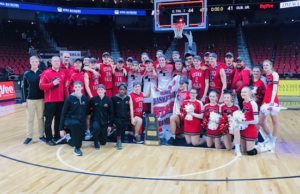 At first we thought that was going to be a big problem, but, eventually, we worked around it and got the word out anyway,” Westhoff said. 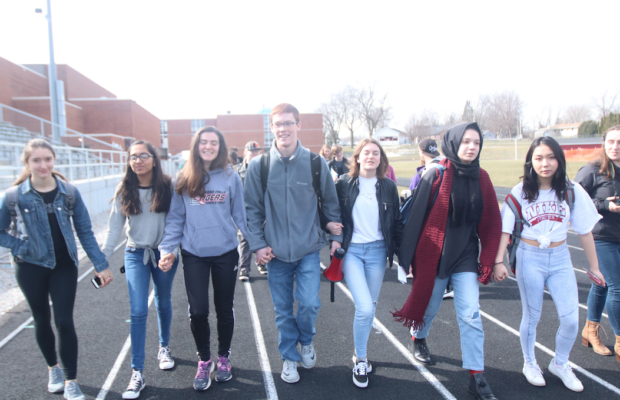 When students arrived on the track, Chenoweth and Westhoff spoke about the purpose of the march and how students can help enact change in the community, encouraging the students to keep participating in events like the walkout. “Those of us that can’t vote, it’s these types of protests and events that are such a necessity to participate in. Every voice should be heard and every voice should matter,” Chenoweth said. Junior Alana Smith, participated in the event and marched out of the school on that Friday for those who will never be able to. “It’s for the people that never got to walk out of their school again. We’re walking out for those people who died,” Smith said. Westhoff also spoke to the students at the walkout. He re-lived his elementary years and talked about how as a fifth grader, instead of learning about math, he learned tips on how to avoid a shooter and how to distract them with tennis balls. He explained the struggle students face during this generation. “Our generation grew up with the fear of mass shootings looming over our heads. An era where it seems like we’re all just waiting for the next school, the next body count, the next stories about the lives of the students that were taken. And still, we still have to go to school the next day,” he said. Junior Benjamin Rogers shares the same fear as Westhoff and joined the many students on the track. “I’m here because I really want to feel safe in my school. I don’t want to feel like half way through the day I want to go home,” Rogers said. Days leading up to the walkout junior Greg Brost posted a Facebook comment stating that he and other students would be revv bombing the walkout and participating in their own counter-protest. 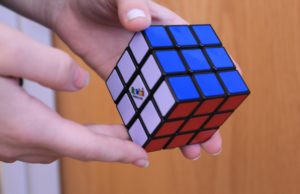 “The main idea of having it was to have a bit of equal representation on both sides. That was our whole thing. We also don’t agree with the reasons why the school walkout was actually happening. That’s why we had the counter-protest,” Brost said. As the students walked out of the high school to support gun safety in schools around the nation, the sounds of engines and yells from students about their right to bear arms accompanied them. The counter protesters revved their car, motorcycle and truck engines to draw attention to their views until the students protesting the gun violence reached the track. There, the counter protesters stopped their disruption to observe the 17 seconds of silence in honor of the 17 lives lost from the Parkland shooting. 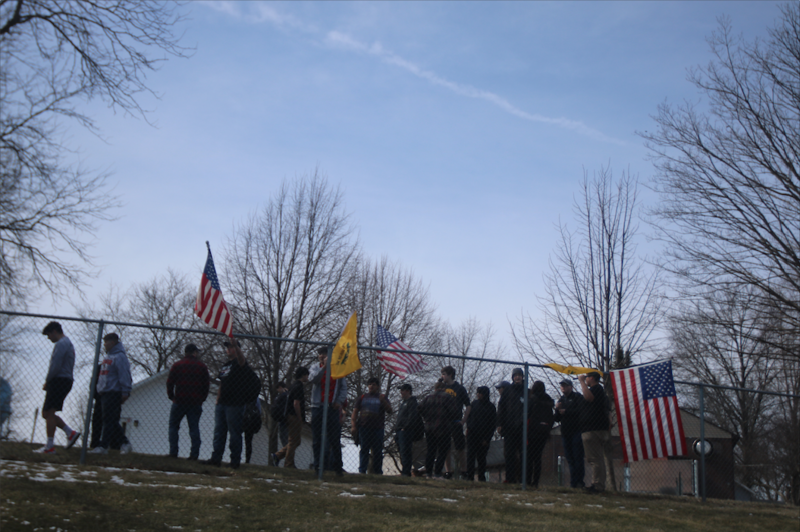 Students at the counter protest held American flags in one hand as they stood as one unit protesting behind the fence adjacent to the track. The counter-protesters had a common goal to get their views heard. Students carrying red, white and blue flags believed that citizens’ Second Amendment rights is a civic right that is being challenged in the nation today. “The main idea was that the Second Amendment is here to stay and banning guns is not allowed,” Brost said. Sophomore counter protester Keller Kremer, like those who joined her, wants action to be taken in the government, but instead of keeping of guns out of school, she wants to arm teachers with guns to ensure safety. “Once again, schools are gun free zones, but like with all other illegal things, it still happens,” she said. “Let’s change that just a tiny bit. Arm teachers. It takes police about minutes minutes to arrive at a hostage situation. A lot can happen in nine minutes. If teachers were armed, they stand a much better chance of survival, protecting the students and lessening the body count,” she said. Although the two protesting groups’ approaches to being heard may differ, the protesters both have a common goal, to end mass shootings. “We all want the same thing. Nobody wants school shootings except school shooters. We just have a different idea of how to do that,” Brost said. About 140 students walked out of class to bring awareness to gun violence in schools. Counter-protesters watched on the side with political flags.